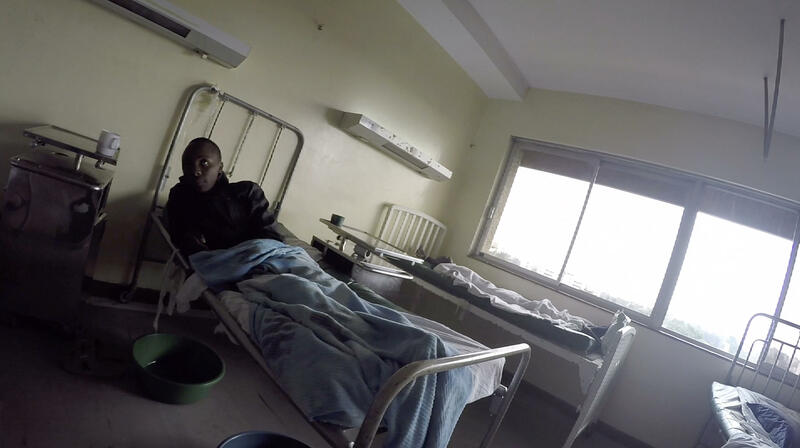 NAIROBI, Kenya -- Doctors at Nairobi's Kenyatta National Hospital have told Robert Wanyonyi there's nothing more they can do for him. Yet more than a year after he first arrived, shot and paralyzed in a robbery, the ex-shopkeeper remains trapped in the hospital. At Kenyatta National Hospital and at an astonishing number of hospitals around the world, if you don't pay up, you don't go home. The hospitals often illegally detain patients long after they should be medically discharged, using armed guards, locked doors and even chains to hold those who have not settled their accounts. Even death does not guarantee release: Kenyan hospitals and morgues are holding hundreds of bodies until families can pay their loved ones' bills, government officials say. "What's striking about this issue is that the more we look for this, the more we find it," said Dr. Ashish Jha, director of the Harvard Global Health Institute. "It's probably hundreds of thousands, if not millions of people, that this affects worldwide." During several August visits to Kenyatta National Hospital - a major medical institution designated a Center of Excellence by the U.S. Centers for Disease Control and Prevention - the AP witnessed armed guards in military fatigues standing watch over patients. Detainees slept on bedsheets on the floor in cordoned-off rooms. Guards prevented one worried father from seeing his detained toddler. Kenya's ministry of health and Kenyatta canceled several scheduled interviews with the AP and declined to respond to repeated requests for comment. "People know patients are being held prisoner, but they probably think they have bigger battles in public health to fight, so they just have to let this go," said Sophie Harman, a global health expert at Queen Mary University of London. "We can't just let people leave if they don't pay"
Hospitals often acknowledge detaining patients isn't profitable, but many say it can sometimes result in a partial payment and serves as a deterrent. "It's not a very good feeling for the doctors and nurses who have treated these patients, to see them kept like this," Njuguna said. "We can't just let people leave if they don't pay," said Leedy Nyembo-Mugalu, administrator of Congo's Katuba Reference Hospital. He said holding patients wasn't an issue of human rights, but simply a way to conduct business: "No one ever comes back to pay their bill a month or two later." Back then, the High Court ruled that the detention of two women at Pumwani who couldn't pay their delivery fees - Maimuna Omuya and Margaret Oliele - was "cruel, inhuman and degrading." Omuya and her newborn were held for almost a month next to a flooded toilet while Oliele was handcuffed to her bed after trying to escape. Earlier this month, the High Court ruled again that imprisoning patients "is not one of the acceptable avenues (for hospitals) to recover debt." "Detentions still go on because there are no rights here," Omuya said. "What I suffered, I want no one else to suffer." AP EDITOR'S NOTE: First in a two-part series on hospitals that detain patients if they cannot pay their bills.